Above we see the Crew Skill Map. This map shows us all available skills and how they correlate to one another. On the bottom, we have all the Crafting Skills and a short summary of what they yield underneath. 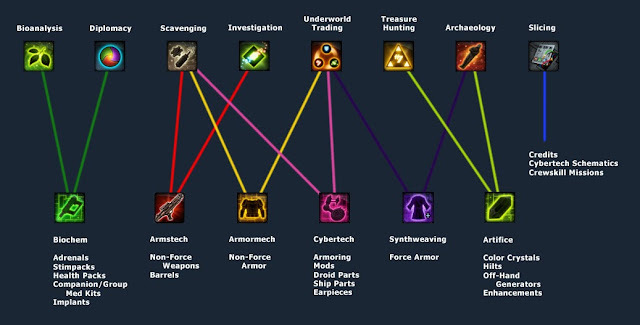 On the top, we see the Gathering Skills and Mission Skills linked to the Crafting Skill that they "belong" to. IMPORTANT: You can only have ONE crafting skill per character! Personal Note: If you're planning on raiding, pick up Biochem for the reusable stims and adrenals. It'll save you a lot of money in the end. Every class has a set of companions that are efficient at specific skills. That being the case, every class has specific crew skills that would be optimal for them. Though not completely up to date, TorCommunity is a great website to get information on crafting skills (among other things). In fact, it's such a good source that I decided to get rid of my guide and just link the specific crafting skills here to its appropriate page over at TorCommunity. But of course, not without adding some notes on each of the crafting skills! Information on the crafting skills and their links follow. Note on Reverse Engineering: If you reverse engineer everything you make, then you will be able to level with about 20% less materials than what is listed on this guide. However, since the materials that you get back from reverse engineering are random, it is impossible to calculate an exact number. Therefore the materials listed in this guide are what would be required if you do not reverse engineer anything. Armormech crafts armor for tech users. This guide uses only patterns that are available from an Armormech Trainer. After you complete each step visit the Armormech Crew Skill Trainer, and get trained up for the next level. The choice of secondary mission skill is dependent upon the class that will be played. For an Imperial Agent, you should take Investigation. These secondary mission skills allow you to collect items that are used when making blue and purple grade gear. Armstech crafts mods, weapon parts, and weapons for tech users. This guide uses only patterns that are available from an Armstech Trainer. After you complete each step visit the Armstech Crew Skill Trainer, and get trained up for the next level. Biochem creates medical packs, stims, and implants. This skill is useful for any and all classes. A huge benefit of this skill is being able to craft medpacs and are not consumed. This guide uses only patterns that are available from an Biochem Trainer. After you complete each step visit the Biochem Crew Skill Trainer, and get trained up for the next level. Cybertech is used to make droids parts, armor plates, mods, ship parts, earpieces, grenades, and even mounts. Its a well-rounded skill, and provides benefits to any class that wishes to use it. This guide uses only patterns that are available from a Cybertech Trainer. After you complete each step visit the Cybertech Crew Skill Trainer, and get trained up for the next level.